We have always been presented with choices. Right from the objective questions in first grade to selecting a brand for your first bike choices follow us. Even for an apt picture for this article, I had to choose. Choices are what decides our life. There are innumerous forks possible if you had chosen something for something else. In most of the cases our choices prove to be irreversible. The magnitude of the choices vary for each situation. 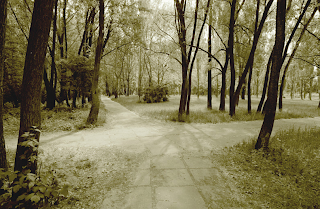 Choices made that are morally and objectively correct are always the toughest to choose. With age, our conscience gets better and unfortunately we tend to know the difference between which is right and which is wrong. At times this may involve in absorbing an insane amount of pain. You don't have to as there is always an exit available in this highway called life, but then success always takes the most toughest path. Its been like that and will always be like that. In the cross roads of life, choosing a path that is made of principles, courage, righteousness and self sacrifice will definitely lead to character and mould us into a better person. Easiest to say, toughest to implement.